Exposure Electronics launches new XM series amplifier and phono stage | What Hi-Fi? 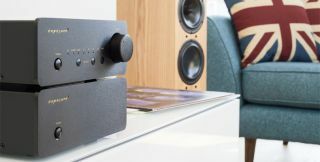 The XM5 integrated amplifier and XM3 phono stage are targeted at vinyl lovers, and both will make an appearance at the Bristol Sound and Vision show. When vinyl records were more common, most integrated amps had an on-board phono stage because of the number of people using turntables. Then vinyl dropped out of fashion, and many amp manufacturers dropped the phono stage on their products at the same time. But now that vinyl has once again enjoyed a surge in popularity, the latest products from Exposure Electronics want to appeal to that market - with the new XM5 integrated amplifier, and XM3 phonostage. The XM5 integrated amp (£1240) includes both a phonostage and a DAC, and has a linear power supply with a large 200VA power transformer. The company says that "only high quality resistors and capacitors are used in the signal path", and it has chosen Toshiba bipolar output transistors for their "superior dynamic performance". As for the XM3 phono stage (£660), its rear panel features MM (moving magnet) and MC (moving coil) inputs as well as adjustable loading and gain switches. Both products are being promoted for their small size, too, being housed in half-width casework as we've seen in the past from the likes of Cyrus. If you want to take a look at them, and have a listen, they'll be at the Bristol Sound and Vision show next month.